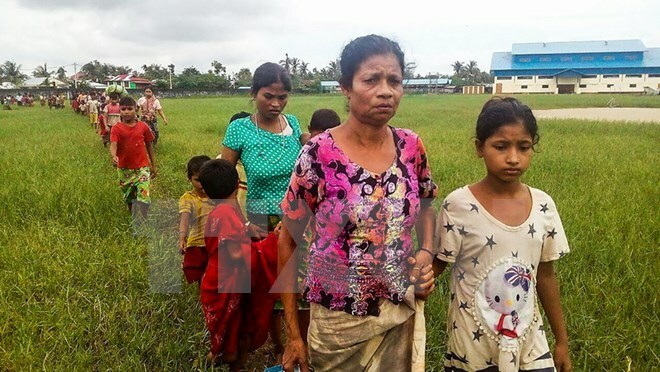 Hanoi (VNA) – At least 18,500 Rohingya in Rakhine state of Myanmar have fled into Bangladesh in the last six days since fighting broke out between government military and insurgents. About 18,500 people have crossed into Bangladesh as of the night of August 29, said Chris Lom, spokesman of the International Organisation for Migration in Asia-Pacific, on August 30. He added that exact figures were difficult to obtain because many of those who have made it into Bangladesh might not register with local authorities. Meanwhile, many people were stuck at the border. Clashes between Myanmar army and insurgents occurred last week as gunmen attacked 24 police posts and broke into a military outpost in Rakhine on August 24. To date, at least 110 people were killed.